Writer-director Sooraj Barjatya and his sister Kavita Barjatya are busy these days making television serials. Their company, Rajshri Productions, has made successful TV shows such as Woh Rehne Waali Mehlon Ki, Pyaar Ke Do Naam - Ek Raadha Ek Shyaam, Yahan Main Ghar Ghar Kheli. They recently launched Jhilmil Sitaroon Ka Aangan Hoga on Sahara One. 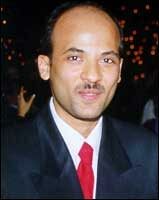 Sooraj Barjatya has not directed a big screen film for a long time, but now he is in the process of making a comeback. He talks to Rajul Hegde about both his small and big screen plans. What were you doing after Woh Rehne Waali Mehlon Ki? We did a few shows on other channels too. I am involved at the concept level while my sister (Kavita) takes care of the entire show with the team. TV is a creative medium. There is a lot of potential. After the tremendous response we got for Woh Rehne Waali Mehlon Ki, we decided to go ahead with more shows. Jhilmil Sitaroon Ka Aangan Hoga is apparently the story of a ghar-jamai (husband who lives with his in-laws). Do you think audiences will accept this? Today, girls are doing well in their professions and men and women both work and contribute financially to the family. Sometimes women earn more than men and money issues do come between them and create friction. What we are trying to say is that money should never come in between a marriage, and we are saying it in an entertaining manner. Your attention seems to have shifted from films to the small screen. In 2005, we realised that the common man is no longer going to cinemas because he cannot afford the high ticket prices. Secondly, they are seeing so much at home, even in villages, for free. At Rajshri, we make family dramas so we felt we know what audiences want. Our audience has always been school teachers, doctors and families so we decided to venture into the TV business. It makes great business sense. We took a deliberate decision to be in TV since the last three years and now it's all set up. It is not easy; it is as important as films. Is the age of innocent romance of the Rajshri type over? No. It will still work. We only hear from the metros, but when we go to our regional offices, our managers tell us what kind of films they want. It is just that in family dramas you have to say it in a manner that will be understood today. For example, the son will respect his father but the father cannot expect his son to touch his feet because his way of showing affection is different. So you have to move with the times but the values remain the same. As a filmmaker, it's our responsibility to make such films otherwise such values will be forgotten. So your next film will also will be on those lines? Yes, but we will slowly move to something else which will be understood by the youngsters today. Essentially, we will make a family film. Your first two films were blockbusters -- Maine Pyar Kiya and Hum Aapke Hain Koun -- but you can't achieve that level of success again. What worked in those two films? Both films did really well. What I strongly believe even today is that a pure Indian film packed with the correct level of entertainment will work -- that is what worked in these two films too. Entertainment is a very big quotient now because when a family spends Rs 1,000 to watch a film, they better get good entertainment. Nothing works like those clean Indian films but it's just that we don't make them any more.
? Your later films worked, but not as well. A Hum Aapke Hain Koun comes once in a lifetime; every film cannot be a hit. You make what you believe in, and you make a commercial success to get back your money so that you are inspired to make a film again. This is what happened to four of my films, including Vivah, which was successful in belts like Gujarat, Maharashtra and Bihar. Main Prem Ki Diwani Hoon is one of my failures, but it was also my greatest teacher. When I made that film I thought let me make what works, and then I realised that as a filmmaker, you must make what you believe in. There is an audience for every film. What I wanted to make that time was what works. That was the time of Dil To Pagal Hai and Kaho Na... Pyaar Hai. So I thought let me also make a film which has style and appeals to the NRI audience. But then you realise that God has made everyone different, each one has his strengths. My audience asked me, 'Where are you in this film?' That is when I realised I must make what I believe in, with full confidence, and also something that is entertaining. None of your films matched the success of your films with Salman Khan. Is Salman your lucky mascot? Yes. We had a good rapport. He is also a great family guy. Somewhere there is respect for each other and we understand what the other wants. He is able to do so many things I wish that I could do. He fulfils everything. Yes, it's a team and I want to take it forward. Can you just pick up the phone and call him any time of the day? Yes, I can, but I don't because I know he is always busy. Right now we want him to look after his health -- that is the primary issue. Whether he makes films or not is not that important now because he has worked all his life, in 100-odd films. You announced your next film with Salman Khan, but he is again experiencing pain in his jaw. Will you wait for him? He's fine, but needs to change his lifestyle and rest. I am still scripting the film. Since I write it myself, I generally take a year-and-a-half to complete. I have just started so there's a long way to go. Hopefully, it should be ready in another six months and in all probability, the film will go on the floors by 2013. Have you spoken to Salman about the film? I am yet to narrate the full script. I want him to hear and then judge it. My first choice will always be Salman. It is my dream to make a film with him again. Do you think you will be able to make a horror film ever, or something other than a family drama? It depends, if I am inspired. Right now there are so many family stories that need to be told so I have not yet gone to that (horror) genre. Any female star you have in mind opposite Salman? I haven't thought about it. It all depends on the script. Any recent films that you liked? What do you think of the new trend and the young film makers? Trends are beautiful because you will get to watch different types of films. A film which I really liked is Rockstar. Imitiaz Ali is doing a great job. He has taken Indian cinema beyond the conventional concepts of filmmaking. Of course, Raju Hirani is the best, and my personal favourite is Adi Chopra's Rab Ne Bana Di Jodi. Devansh will be graduating soon; he wants to join me in filmmaking. My younger son is doing chartered accountancy and wants to take filmmaking as a business. Will Riteish-Genelia dance to these songs at the wedding? The BEST way to propose, Bollywood style!